As its name suggests “Orientation” is just that. This is the first of 5 books in the Commorancy series by Al. K. Line which presents the world in the grips of a disease called “The Lethargy”, where those afflicted just give up and waste away until they finally pass on, trapped in a waking coma of sorts. Not everyone succumbs the Lethargy however those who remain unscathed are deemed “Whole” and those who succeed in harnessing an inner potential to become more than the Whole are termed “Awoken”. Once Awoken, you can stop the aging process, see into the Noise (where all things are), enter and manipulate the minds of other persons and animals and many other things. 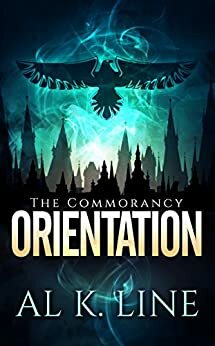 “Orientation” centers around Marcus, the Awoken founder, creator and Leader of the Commorancy, a sanctuary hoping to preserve humanity currently on the brink of extinction. While the Commorancy is a vast structure consisting of many Rooms, there is only room for 7 “guests” at a time. Having passed a series of tests and riddles in order to obtain an invitation from Marcus himself, each Guest may remain for as sort or long a time as they require, as long as they follow the Rules that have been set forth. The most recent guest to arrive, Letje, a 15-year-old girl with her pet tortoise in tow, seems to have her Orientation interrupted at every turn. In addition to Marcus and the Commorancy, we find out that there is another Awoken sect called The Eventuals led by Varik whose goal is the total extinction of humanity. As the attempts from the cult to infiltrate and bring down Marcus and his life’s work intensify, Marcus is forced to break one of his cardinal rules in an attempt to stop them. He must disturb his guests and organize a defense in an effort to stop this most recent and significant threat. Having read a few other books by Al that come after this series it must be noted that the idea of the Commorancy, The Lethargy, Awoken and The Eventuals are not confined to this series alone and have also appeared in at least two others that I am aware of. That being said, it was really nice to go into the back story of the mythical Marcus and see the “man behind the mask.” There is a scene in the “Room for Evening Drinking” that really served to get inside the man and show that for all of the amazing things he has done, he is only human… even if he is hundreds of years old. The back stories of the 7 other guests, how they came to be at the Commorancy and their reaction upon being brought out of their rooms, were also enlightening. Varik, as an antagonist and leader of the Eventuals seems to embody just exactly what can go wrong when religion is perversed to the point of blasphemy. The cult of the Eventuals, his blind following flock and lengths they will go to in an effort to bring about the extinction of what remains of humanity is chilling. The ending is a definite “WTF” moment and will definitely leave you wanting to plunge right into “Contamination” to continue this story.